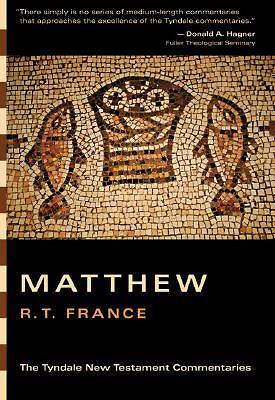 Why did early Christians place Matthew first in the New Testament? "The early Christians were conscious, in a way few Christians are today, that their faith had its roots in Judaism. The issue of the relation between the Christian Church and the Jews remained a vital one both for the Christian's self-understanding and for their presentation of Christ to the non-Christian world. And it is Matthew's Gospel which more fully than the others provides a Christian perspective on this issue. In its constant reference to the Old Testament, its strong Jewish flavoring, its explicit discussions of the conflict between Jesus and the Jewish authorities, it forms a fitting 'bridge' between the Old and New Testaments, a constant reminder to Christians of the 'rock from which they are hewn.' " --R. T. France, in the Introduction The Tyndale New Testament Commentaries have long been a trusted resource for Bible study. Written by some of the world's most distinguished evangelical scholars, these twenty volumes offer clear, reliable, and relevant explanations of every book in the New Testament. These Tyndale volumes are designed to help readers understand what the Bible actually says and what it means. The introduction to each volume gives a concise but thorough description of the authorship, date, and historical background of the biblical book under consideration. The commentary itself examines the text section by section, drawing out its main themes. It also comments on individual verses and deals with problems of interpretation. The aim throughout is to get at the true meaning of the Bible and to make its message plain to readers today.